The Zip Hex is part of Gerber's Daily Carry selection, being small enough to fit on a zip pull or a bag pull. Gerber GDC utilities are designed to go wherever you go, because the best tool in the world is useless if you don't have it with you. Hex head screws are everywhere, especially on your gear: bikes, boards, skis, ATVs and muzzle brakes. Five tools in one, the palm-sized hex's rotating wheel holds the five most commonly used metrick allen wrenches. Choose a bit, snap it into place, and a ball detent mechanism locks it in place. The lightweight, grippy handle resists slippage, and the stainless steel bits will hold up to serious torque. 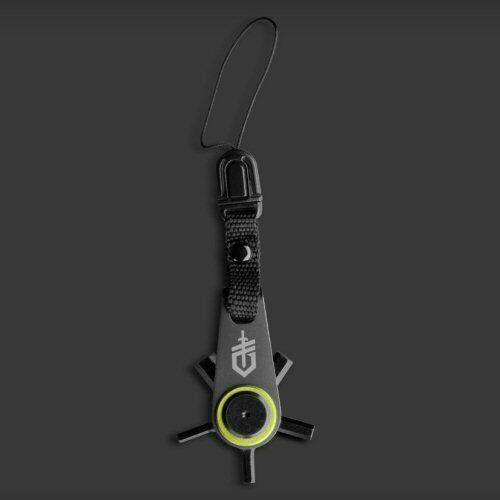 The quick release clip makes for easy removal from keychain or zipper, and the compact size means it won't hog valuable space in your pocket or bag. Gerber tools are backed by Gerber's Lifetime Warranty. Hex key sizes 2.5mm, 3mm, 4mm, 5mm and 6mm. Overall length 53mm, steel type 420 Stainless, handle material 3Cr13.